Neville Berry is seeking current information concerning this classic Leyland Merryweather TL (GHW415) that served Bristol, I photographed it at some type of oldtimer rally near Reading several years ago. It's a standard normal control (or conventional) Leyland. For some reason it was parked in this rather strange position at the edge of a field. Does anyone know when it was delivered? Bristol also ran a double seat open Leyland engine plus a fully enclosed Leyland engine with four door limousine type body and possibly others,but these are the only ones I photographed many moons ago. This lovely appliance was delivered on 21st November 1940, at some stage it was moved to Wiltshire, and was stationed at Salisbury. The tl remained in service after the war with Wiltshire Fire Brigade.some years ago she returned to Bristol in preservation, as far as i know she is still in preservation in the Wiltshire area. Added by Bob on 28 December 2008. Thanks for your comments, they may help Neville track it down. Do you know if it was part of the Home Office order seeing the first letter of the license plate is a G. It was interesting to me when I photographed if that it and the one that had served in Liverpool were at this show near Reading. Added by Bob Graham on 28 December 2008. Hello Bob from Bob, according to Dennis Hills excellent book on Bristol Fire Brigade GHW 415 was a subsidised tl under the Home Office scheme for wartime emergency fire fighting, hope this answers your query. Was the rally at THEALE near Reading?, if so i was there as well. Added by Bob on 29 December 2008. The rally was most likely at"Englefield Park" a stately home near Theale. A fireman from Berkshire named Ian was taking it to rallies/shows at that time.Somewhere I have a programme which I hope would confirm details. Added by Alan Jones on 29 December 2008.
appliances for the war effort, this commenced from 1941 until 1945.
sold for scrap but was saved thankfully and is now in presevation. Added by Pete Matten on 29 December 2008. While not wishing to dispute anything, i quote from the Leyland Societys booklet LEYLAND FIRE ENGINES 1939-1942, "This TLM/Merryweather 100 foot steel turntable ladder was delivered to Bristol Fire Brigade in November 1940". An additional note states that this is one of 15 built under a Grant Aided Purchase scheme, the chassis number is 100453. The vehicle was taken over by the NFS in August 1941 and moved to Salisbury. Roger Pennington called'British Fire Engine Heritage'first published in 1994.
trying to mislead anybody, just quoted what information was available to me. Added by Pete Matten on 30 December 2008. Pete, absolutly no problem, like you, i am only quoting other sources but as you say, the Leyland Society are probably more reliable than most. Added by Bob on 30 December 2008. Many thanks for all the information. Just out of curiosity would anybody know how many of these fire engines are still about? Also would anybody know where it is being kept or even who now owns it? Added by Neville Berry on 30 December 2008.
not just the TL's, but how many of these appliances are in presevation today. by sending in a picture of an appliance, information will come to light. Added by Barry on 31 December 2008. Reference this batch of TLs (I recently listed them all under another reference), they were not supplied to the NFS, but were supplied under an Air Raid Precautions contract - hence their local registrations. Added by Ian Moore on 31 December 2008.
delivered before 1941 and can be viewed looking at picture #12875. Added by Pete Matten on 31 December 2008. Added by Jason Lester on 01 January 2009.
many years ago but somehow never got around to it.I'll do it in 2009, Thanks. Added by Pete Matten on 02 January 2009. Jason many thanks for the information on the whereabouts of the Fire Engine.Is it possible to obtain the address of where the Fire Engine is being kept as I would like to see it again as I worked for the company that restored it. And it has been a long time since I have seen it. Added by Neville Berry on 02 January 2009.
it is in westbury in wilts if you email me on jaywayne75@yahoo.co.uk we can talk further he has a vast collection of vehicles or i can swap numbers and arrange a joint visit? he also runs the westbury transport gathering and his vehicles are on display then around april or may i think? Added by Jason Lester on 02 January 2009. I e mailed you on the 4th of January trying to see if it would be possible to arrange a visit to see the Fire Engine. I'm not sure if you received my e mail as I still haven't heard from you. Added by Neville Berry on 28 January 2009. Added by Jason on 18 February 2009. Barry, I went and had a look at the Fire Service Preservation Group web-site, the URL as shown above. Well worth it; I recommend it to fellow readers. So good to see the Fire Engines and their history getting saved and preserved. Added by Pat Rivers-Bowerman on 19 February 2009. Added by Jason on 20 February 2009. Added by Ian Phillips on 24 February 2010. Ian P. - what had happened to it? If it is the same Engine, 'GHW 415' as described above; there was a lot of money and effort put into restoring, preserving and showing it. Added by Pat Rivers-Bowerman on 25 February 2010. It is a great shame if this engine has been scrapped. When we saw it in the summer of last year at Flowers Farm it was in a reasonable condition and was only missing a carburretor. Added by Neville Berry on 25 February 2010. Broken for spares? What a disaster. A piece of Leyland History gone forever. Added by Richard Aston on 27 February 2010. My late father was a fireman in the BFB for about 30 years and drove engines similar to this and spoke fondly of them. He was at Bridewell when these appliances were there and told a tale of driving one out of Bridewell one night and turning right to the round about in front of Lewis's and up Union Street - when this was possible. Going around the round about one chap was still adjusting his uniform and loosing his grip fell off! Apparently he was unhurt but I can't remember if they stopped for him to get back on! Added by K. C. Ettle on 26 March 2010. Added by Richard Aston on 26 March 2010.
what is license plate number? I may have a shot of yours. Added by Bob Graham on 27 March 2010. Thanks for the interest. The registration is DHY 496. I have some photos from Dennis Hill and the late Fred Hooper but any more would be great. Added by Richard Aston on 27 March 2010. 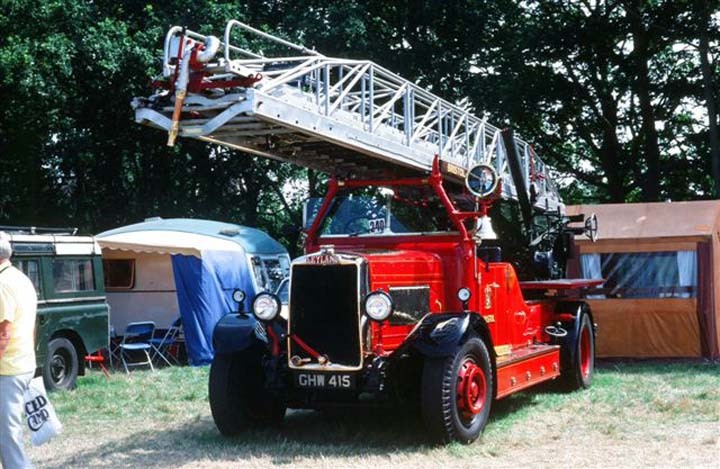 Leyland was the importer for Metz ladders in the 1930s - and if we see a Leyland TL from this era it is usually a Metz. Obviously, after September 1939 there were no more Metz imports. But my question for Leyland fire engine historians is this. When did Leyland start providing chassis to Merryweather for their ladders? Was it only after the supply of Metz ladders dried up, or did they "double dip" in earlier years by building complete Metz Tls and simultaneously supplying chassis to Merryweather? Added by Rob Johnson on 20 August 2014. My Grandfather served in the Bristol Fire Brigade and was killed in car accident when on a call out. I have access to pictures of the Fire Brigade in central Bristol at the time. Added by Lynne on 28 September 2015. I own an ex Bristol Leyland fire engine, reg: DHY 496. It was in service between 1937 and 1964. If you have any photos that cover that period I would be very interested. Added by Richard Aston on 30 September 2015.
ok I will look when I next visit Dad. I know there was one with all the appliances outside the fire station but it may have been slightly earlier as my grandfather died in 1934. I'm pretty sure he was on a leyland when he was knocked off. Added by Lynne on 30 September 2015. Lynne, if the appliance was HY4979, it still exists. It is now in North Wales I believe. Like Richards comment, I too would be most interested in any pictures. You can see where I live by my name. Added by Bristol bob on 01 October 2015. Hi Bristol Bob! thanks I've heard from its owner who is the process of restoration. Will get things together on my next visit. Added by Lynne on 02 October 2015.